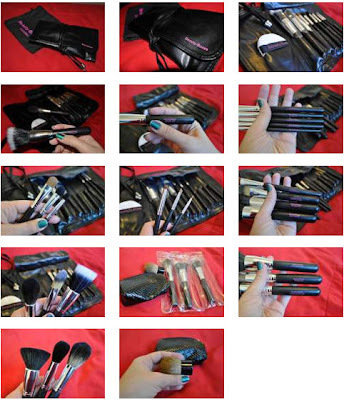 Oh, I was delighted to receive a set of make up brushes from Beauty Boxes. Yes, you remember right, they are the people responsible for that gorgeous Genoa beauty box I can call mine (by the way, we are so happy together). I got the set that comes in a lovely pouch and comes with 9 brushes: 3 face (duo fibre, blusher and foundation), 5 eye (shading, blending, crease, small shader and angled brushes) and lip liner. It also come with a soft powder puff. In addition to that, I got the angled contour, the flat powder, a normal powder and a cute kabuki brush in a pouch. The quality of this brushes is very good, they are all very soft on the skin. All brushes have the brand and also their function printed on – which is excellent for beginners! Starting with the face, I found the powder and blusher really soft! They pick up product well, and distribute evenly. The foundation brush is also soft but firm enough, also with even distribution. The flat powder and the angled contour are precise. I love the flat powder to apply finishing/setting powder and the angled to chisel cheekbones! The kabuki performs really well, love it for buffing and blending powders. The only one I wasn’t too keen on was the duo fibre; I use this type of brush to apply serum and then primer. Somehow this one didn’t work as well for me as my current one – but that might be because I am so used to mine. All the others however, are fantastic! The eye brushes are also great. The shader have the right texture – not too soft, not too hard. The crease and blending ones are fluffy to do the job right and the angled liner is precise. I created this festive gold look using some of them. The lip brush is also good, although I think it can double up as an eye liner and I don’t line my lips with a brush – I use a pencil! 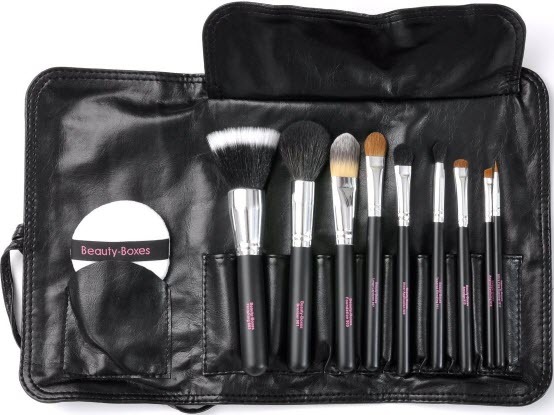 The set of 9 brushes retails for £71.45 – that is great value at under £8 per brush – really recommend this set, it is a really reliable all rounder. The other four brushes are sold individually and cost between £19.45 and £29.95 and they do free delivery! For more information on the Beauty Boxes brushes (plus other goods) and to buy online, click here. Custom Cardboard Boxes are selling in a comprehensive range which is perfect for house moves and industrial products. Get Instant Printing is a leading company in the UK make easier the production and delivery. © 2013 Beauty Boxes Blog, AllRightsReserved.